Happy Friday (Thursday evening depending on when you are reading this!)! This week’s theme is one I love talking about: ways to stay healthy over the holidays. 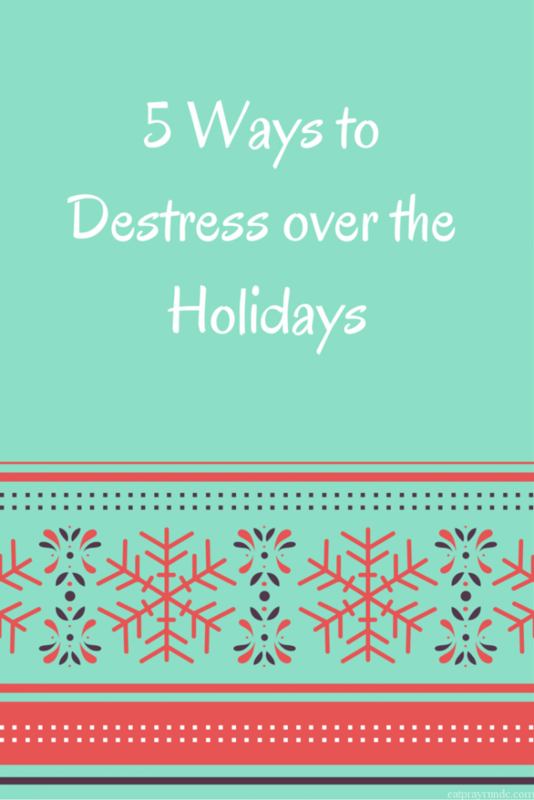 I thought I’d flip it a bit and focus on five ways to destress during the holidays. For a variety of reasons, the holidays can be an extremely stressful time for folks. I hope these tips are helpful as the season rapidly approaches. As for my weekend plans, you probably know that I’m running the Richmond Half Marathon on Saturday (check out my goals and tips here) and I’m so excited for a fun, low-pressure weekend of running! Per usual, I’m linking up with my girls Cynthia and Mar for the #Friday Five. You can read our linkup rules here. Please note that if you don’t play nicely, we will delete your link. Go give Cynthia some love for rocking her last Triathlon of the season last weekend in crazy hot temps! That lady is amazing! As for Mar, go check out her goals check in post – it’ll resonate with you, I promise. My friends are great! Hope everyone has a great weekend! Go shopping. I know, shopping IS stressful, right? Wrong. Not if you go online. Come back here in a week for an awesome online shopping holiday gift guide to help you out! My main suggestion with this one is start early and start online. Shopping on December 23rd at 10pm IS stressful. Shopping at 12:30pm during your lunch break online on November 20th is fun. Stress versus fun, y’all. Get moving. There are so many fitness challenges during the holidays you can literally take your pick. There are also a ton of fun runs, themed holiday runs and the like. I always run a turkey trot each year and it’s worth it just to see the costumes. Take advantage of the season’s produce. We just joined a CSA and it is awesome. We get delicious and fresh veggies every week that I then use in our meals. I love it and fall is really such a great time for so many vegetables – try shopping what is in season! Go see a movie. If only to get the two hours of quiet time. With all the new cozy theaters with reclining seats, I am ALL about this strategy! How do you destress during the holidays? this is why we are friends… always on the same page 😉 have a lovely weekend my friend and good luck in Richmond! Great list of ways to destress! So true to get shopping done early and online! Online is much simpler than busy lines at the stores. Yep, a bit of online shopping always does the trick for me 😉 . Happy weekend! Love these! I’m a big fan of shopping no matter what time of year it is, so I’m all over #1. And I love #5! I’m definitely going to do that this year! Yes! I agree 100%. These few weeks are completely stressful and it’s the most important to remember how to prevent the excess stress. The remembering the reason for the season is such a good reminder! Thanks as always for a great link up. I completely agree that the earlier you start the less stressful it is. I normally online shop for the most part anyways. Great tips! I like shopping in Old Town – the stores are usually decorated nicely and you can find unique gifts. The atmosphere is more festive than stressful. Good luck tomorrow! I love the movie idea. I need to rent a kid so I can go see the new Peanuts movie! I also think exercise is a great wasy to destress and I am all over online shopping as well. Have a great weekend! I especially love #5! Why are we doing this again?? I am a big online shopper. I also pick up gifts throughout the year. My in-laws insist on gifts despite us being grown and having no children. It used to stress me out but now I buy things when I see them and stash them for the holidays. It makes it a lot less stressful! Unfortunately, I actually do find shopping a good destressor. Unfortunately since I don’t work! And since I don’t work, I can go when it’s not crazy busy. But because I don’t work I do have to watch the spending. Don’t get me wrong, my husband makes a good living, knock on wood, we’re very blessed. I love going to the movies and now is definitely the right time, but unfortunately I can’t leave Chester that long. He can’t hold it that long. I could go on the weekend by myself, but I spend so much time by myself already that it’s just not appealing right now. But it’s just this year. Everything passes, so to speak, and this will pass too. I’ve already started my Christmas shopping. I have some small gifts and will start ordering the bigger gifts. I’ll let the vendors ship the gifts so waiting in line at UPS or the post office doesn’t add more stress either. I just warn the recipients it may not be wrapped so don’t open it early. Yes for online shopping! No temptations around. Every time I’m at the mall holiday shopping, I want to buy a Starbucks or a pretzel or something. All great tips, especially for someone who is already dreading getting ready for the holidays! Best of luck this weekend, I hope you have a great race! Shopping online is pretty much the only way I shop any more. So much less stress. And I love the movie idea. I’m a sucker for those theaters with the comfy reclining seats. i find shopping TOTALLY destressing, as long as i do it early. i usually make up my list of what i want to get people in november so i can slowly get everything done, and then it’s not a problem. my biggest source of stress for shopping is wrapping things! i hate doing it, so you can usually find me christmas eve, surrounded by wrapping paper and bags hahah. guess i don’t have it too bad in that respect! This is a great list. I love me some retail therapy. HOWEVER, I totally hate it during the holidays. And movies… Yessssss to movies!! Great tips, Courtney! I think we can bring on stress to ourselves so being mindful of the pitfalls is really important. I especially love #5 because you’re right! Keeping in mind what’s most important is a sure way to enjoy the holidays no matter what stress may pop up. I really hate how commercialized Christmas has become, especially with Christmas decorations already up in abundance and Christmas music being played nonstop in stores and on multiple radio stations. It definitely detracts from the real meaning of Christmas. Yes, online shopping is totally where it is at! Truth be told I really only by small gifts for my family, Neil and I don’t really exchange gifts. This year we are going on holidays so that is our gift to each other! Definitely remembering the reason for the season is important too! When I first read your title I thought it said “ways to dress for the holidays”…haha! I hate shopping so online shopping is how I get most of mine done! Two big movies coming out: Mockingjay II and Star Wars! Looking forward to pausing life to go see them! My Friday Five this week was online challenges! i try and do my holiday shopping throughout the year so when it is holiday time, I am almost done! I’m with you on the Christmas music, Courtney; the cheesier, the better, too – ha! I worked in retail for a number of years and, while it did get old after awhile, I really enjoyed the old Bing Crosby classics and so many other “cheesy” Christmas tunes. They really get me into the spirit of the season, as well as following some type of Bible study. I’m doing the study on Matthew right now, with First 5, and I’m really enjoying it. I also have done quite a bit of online shopping already; Amazon and I are pretty tight this time of year – ha! Jonathan made an Amazon wish list and it has been so helpful. Hope you have a great weekend! Great tips! I always go see a movie on Christmas Day! A lot of movies come out that day and the theaters aren’t super crowded. My family celebrates Christmas Eve so Christmas Day is usually just visiting friends/ family! I’m a huge online shopper. I hate crowds…I hate shopping…so it’s really nice to do the deed from my couch!!! Great tips all around. Important to keep the stress level down to make everything else of the holidays better. Agree with all of these. I have signed up for a holiday challenge and it definitely makes me think twice ! Thanks for the link up !